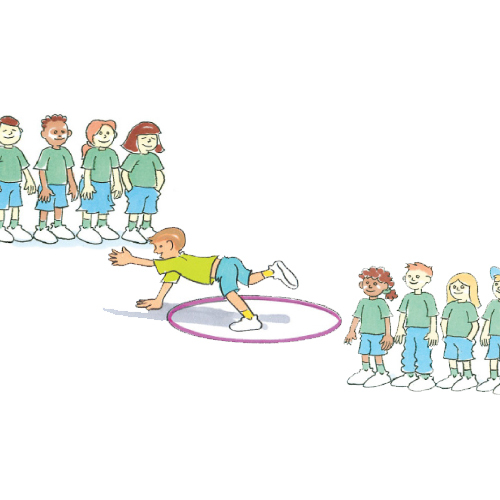 Hoop relay run is an activity that practises movement exploration and raises awareness of body parts. Divide your players into groups of even numbers, lining up at each end of a 10-15 metre running space with a hoop marking the halfway point. The first players of each group runs to the hoop; performs an activity called by the coach then runs to the opposite end and tag the next player. After the tag, that player runs to the hoop, performs the activity and runs to tag the next player. This continues in a relay format until all players return to their original positions. This activity can be done competitively, racing against the other groups. Can you show me different types of movements we can do at the hoop?